About "Displaying analyzing and summarizing data"
When we want to understand something about a data clearly, we need to do the following processes on the given data. We display, analyze and summarize the data, when we want to answer some questions about the given data. Look at the data given in the table and answer the questions. (i) In which year, is the production of rice maximum ? (ii) What is the ratio between the production of wheat and rice in the year 2007 ? (iii) How many metric tonnes of wheat was produced in the year 2005 ? (iv) What is the difference between product of rice and wheat in the year 2008 ? (v) What was the increase in production of rice from 2007 to 2008 in metric tonnes ? 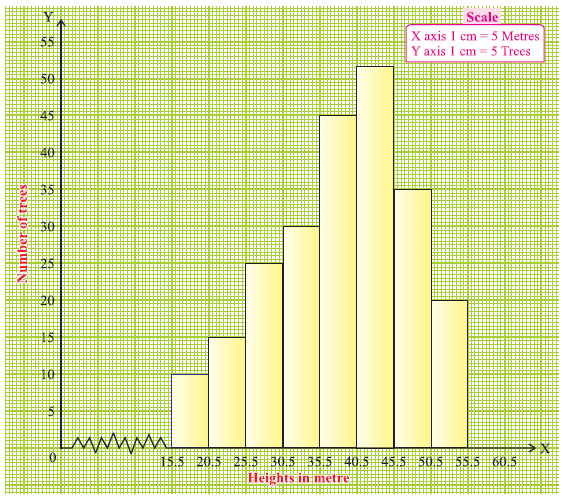 Look at the data given in the histogram and answer the questions. (i) How many students have scored marks from 0 to 10 ? (ii) Find the interval of marks have been scored by maximum number of students. (iii) How many students have scored marks from 70 to 90 ? (iv) What is the difference between the number of students in scoring marks from 60 to 70 and 90 to 100 ? 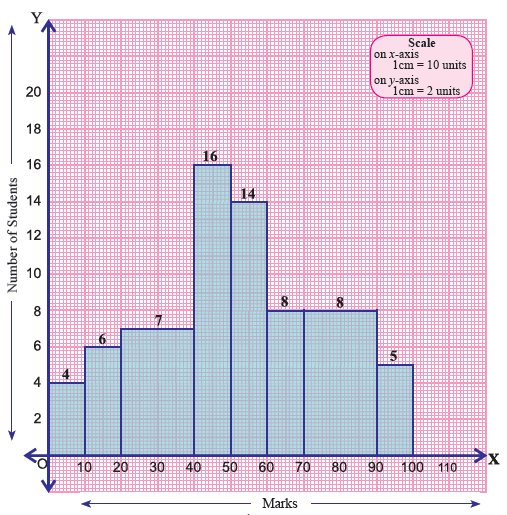 (v) Find the total number of students in the mark interval 40 to 60. (i) How many trees do have the height from 15.5 to 20.5 meters ? (ii) Find the interval of height where the maximum number of trees are there. (iii) How many trees do have the height from 35.5 to 40.5 meters ? (iv) What is the difference between the number of trees in the height 20.5 to 25.5 and 45.5 to 50.5 ? (v) Find the total number of trees in the height interval 45.5 to 55.5 meters. 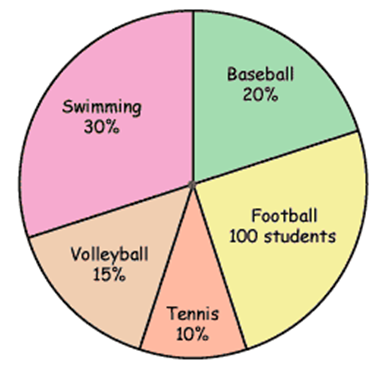 400 students were asked about their favorite sport and information received from them is given as pie chart. Use the information given below and answer the questions. (i) How many students prefer swimming ? (ii) What percentage of students like foot ball ? (iii) What is the difference between the students who like foot ball and swimming ? (iv) How many students would like to play volley ball ? (v) Which sport do most of the students like ? After having gone through the stuff given above, we hope that the students would have understood "Displaying analyzing and summarizing data".